One of the greatest paradoxes of human behavior is our tendency to say one thing and do something completely different. We think of ourselves as positive and fair-minded, caring about other people and our environment, yet our behavior lets us down time and time again. Part of the reason for this is that we may have two separate 'selves': two separate and dissociated mental systems - one conscious, reflective and rational, and one whose motives and instincts are rooted in the unconscious and whose operation resists reflection, no matter how hard we try. In all kinds of areas of our life – love, politics, race, smoking, survival - one system seems to make very different sorts of judgements to the other, and is subject to distinct, hidden biases. The Conflicted Mind explores how and why this system operates as it does and how we may use that knowledge to promote positive behaviour change. However, the ‘conflicted mind’ is a broader concept than just the clash between potential (hypothetical) systems of thinking, because in one form or another it forms the very pillars on which the edifice of social psychology is built. 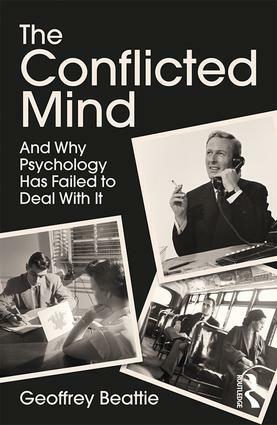 This unique book therefore examines key social psychology theories and research in a new light, including Festinger’s concept of cognitive dissonance, Milgram’s obedience experiments, Bateson’s description of conflict in communications, and Bartlett’s explorations of the constructive nature of human memory. Professor Geoffrey Beattie is Professor of Psychology at Edge Hill University and in recent years a Masters supervisor on the Sustainability Leadership Programme at the University of Cambridge and Visiting Professor at the University of California, Santa Barbara. He was Professor of Psychology at the University of Manchester from 1994-2012. He has a Ph.D. in psychology from the University of Cambridge and has been awarded both the Spearman Medal by the British Psychological Society for 'published psychological research of outstanding merit' and the internationally acclaimed Mouton d'Or for his work in semiotics.